Life becomes art, when we learn the art of living, living mindfully. Just as mindful living begins with taking up some kind of meditative practice, soulful living begins with prayer. Then even the art we create is soulful, as the life we are creating is. Mindful photography I feel it is an organic development once we start practicing mindfulness meditation. Just like mindfulness walking, or eating we can add mindfulness to witnessing the life around, and soon we'd start seeing frames, as in frames in a camera, and a life event occurring, when you do that - go click! Try observing the ordinary and the mundane...look for God in the details of your life, literally! 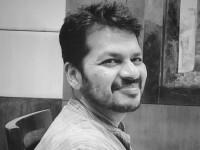 Abhishek Joshi: Gurgaon-based Certified Past Life Regression Therapist, Workshop facilitator, Healer, psychic, writer, channel and a passionate photographer. I have been photographing for the past 20 years, picked up during my years in advertising. I use photography as a medium to express my insights into life, during my journey towards the light. Shipping will be done through reputed couriers only. Shipment usually takes up to 8-10 business days. For international customers we use India Post Registered Service. Exchange only of prints damaged in transit. In such a case you can return the products within 7 days from date of receipt for exchange or refund.